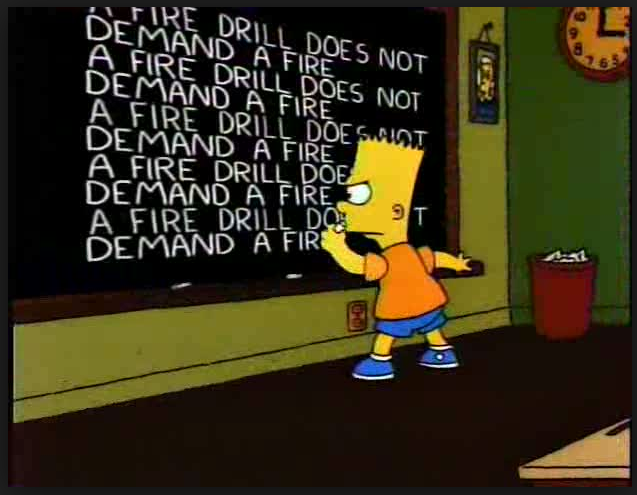 We do a lot of fire drills in schools. Sometimes I feel like it’s enough to make a fitness regiment, “Conquer childhood obesity with the Fire Drill Workout!” There are many categories of drills to learn from the good old-fashioned fire drill to evacuations and lockdowns. I claimed a pole at the top of the hill as a reference point, because when the entire school marches out, my students can find me, be inventoried, and the drill goes like clockwork. I take drills seriously. My students have questions, “What if?” I give honest answers. And I expect immediate obedience in return. I’m usually less strict, but not during drills. No laughing or cell phones, just compliance. They respect this. My six-year old came home and plopped on my lap. “What did you do in school today?” I asked. “We had a fire drill.” he said. I’m curious as to how my elementary counterparts accomplish these drills. In high school, they do what I tell them to do, and they know to find me at The Pole if necessary. But a bunch of six year-olds, including one like Declan, a pinball just released from the spring? I have to know. “What do you do in a fire drill?” I asked. “We line up and go with Miss F.,” he replied. “Where does Miss F. bring you?” I asked. “Outside, but we don’t get recess,” he said. He wasn’t happy. “How long do you have to stay there?” Standing in line looking at the slide and swings must be as much torture as my kids leaving their iPhones in their pockets for 20 minutes. “Until Mr. B. says so.” Mr. B. is the principal. I’ve asked Declan what Mr. B.’s job is–just to see what a six-year old thinks an educational leader does for a living. “Oh,” he said, “he holds the door open for us and says, ‘Good morning. '” That’s a really important job. I’m glad the taxpayers of my town pay someone to do it. “What else does he do?” Surely, after the good mornings have been said, there must be some productive work that needs considering. “No, he says goodbye to us, too.” Also important. Unfortunately, however, we discovered Mr.B. takes time from his busy schedule greeting people to tell curious six-year olds not to peek in the girl’s bathroom when the door’s open. I hope he gets paid extra for that. “Are there any other types of drills?” This is really what I want to know. What is six-year old’s perception of deadly serious drills involving SWAT teams, codes, and pretty scary concepts? My students know. “We have a lockdown drill.” He does know. He knows the vocabulary. “What’s a lockdown drill?” He stares at me like I’m dense. Everyone knows what a lockdown drill is. Sadly, if he knows, he is right. “Where do you go?” I ask. In my class, these types of drills require some close proximity. This is dangerous with teens, the years no one showers after gym and a handful object to hygiene in general for religious, social, or environmental reasons. The other half think the opposite gender is attracted by twenty sprays of cologne. I address this in September by instituting the “shower suggestion,” and the “one-spray rule,” reminding everyone these rules remain in effect for drills. Declan tells me where they go. And that they have to be very, very quiet. “Are you very, very quiet for Miss F.? My kid’s the one that earns the teacher an extra big Christmas present. He giggles. “I farted.” Fantastic. Twenty-five six-year olds trying to be quiet during a drill with my kid passing gas. He had that look of pride on his face that only a master fire drill farter can have. “I farted really loud. Lockdown drills are fun! I’m going to fart every time.” Note to check email for teacher note. “I’m going to fart every time!” I’ve never punished a kid for passing gas during a drill. It’s happened. I let the social hierarchy sort it out. I’m glad Declan enjoys his drills. It’s an art and science getting emergency scenario down to clockwork so they seem part of our normal routine. The fact that they are routine makes me a little sad. I tell my students we didn’t have such things in my day. School was much more relaxed. I wish I could give them the gift of that feeling, but society has changed, and we along with it. It’s a good thing that the biggest events these drill hold for me are kids passing gas, failing to shower, and being annoyed that they can’t have another recess. This means that Mr. B. can go back to his primary job of holding doors, saying good morning and helping with lunch, and I might get a chance to finish my lesson and remind students to shower in case of drills. Surely they had fire drills when you were a kid? We also had tornado drills where I lived, but we were blessed to live in the golden years between Nuclear Fallout drills of my mother’s childhood and the lockdown drills that are the modern equivalent.